HRDC Job Bank (also known as Job Bank or HRDC) connects job seekers to Canadian job openings. As of January 2019, the site contains over 70,000 job listings. In addition to searching for available jobs, users can upload and manage their resume, create email job alerts, and match their profile to employer job postings. You can also get information on job market trends around the country and across industry sectors. This section offers employment statistics in Canada to help job seekers understand where the opportunities (short, medium and long-term) might be in a local community and around the country. For instance, the 2015 Job Vacancy and Wage Survey found that there were 401,000 job openings in Canada in the third quarter of that year and the job vacancy rate was 2.6 percent. You can also read results on job vacancies by occupation, hourly wage, full- and part-time status and by type of position. Surveys are available for Alberta, British Columbia, Manitoba, Newfoundland, New Brunswick and Labrador, Nova Scotia, Northwest Territories, Ontario, Prince Edward Island, Quebec, Saskatchewan and Yukon. Register online to use HRDC tools like Job Alert, Job Match, and Resume Builder. 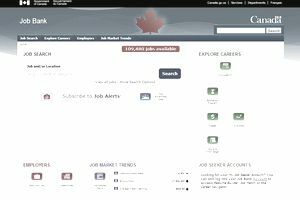 Registered users can create a resume online and use it to apply online for federal jobs or to apply directly to employers using the contact information in the job posting. Registered users can sign up to receive new job postings twice a day via email. Use the job search to search for jobs by industry, keyword, job title, location, and more categories. Application instructions are listed in each job posting. This unique section offers users the ability to search not by occupation but rather by particular abilities. For instance, the Skills section has categories covering Handling Goods and Materials; Building; Operating and Repairing Equipment; Machinery and Vehicles; Working with Technological Equipment and Machinery; Service and Care; Communication; Creative Expression; Information Handling; Analysis and Management. Within those areas you can check off skills such as Mechanical Installing, Maintaining and Repairing; Debugging and Reprogramming Technical Systems; Operating Stationary Industrial Equipment; Counseling and Nurturing; Teaching and Training; and Recruiting and Hiring. The Knowledge section covers Manufacturing and Production; Communications and Transportation; Law and Public Safety; Social Sciences and Arts; Education and Training; Mathematics and Science; Engineering and Technology; and Business, Finance and Management. Job Match allows registered users to create and manage job profiles that can be advertised to employers using the Job Bank and/or matched against existing job advertisements in the Job Bank. Training and Careers offers career exploration, training and learning options, plus worker rights resources for Canadian workers and job seekers.